Annie and Martin have been renovating the previously named Maidenhead Inn for the past 12 months and opened the doors for business in early December 2013. They have sympathetically updated the old pub, which dates back to 1725 (as confirmed in Parliamentary Papers), restoring the oldest part of the pub and the original features. They have added some new features too, in particular creating a patio overlooking the mature gardens and grounds, using local stone, to enable customers to enjoy a pleasant drink and freshly prepared food in a warm, relaxing space. 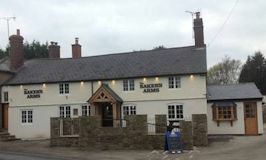 A unique feature of the pub is that they will be preparing and baking fresh bread daily, which will feature on the menu and will also be available for customers to buy and take home. Annie and Martin look forward to welcoming residents and visitors to The Baker’s Arms.